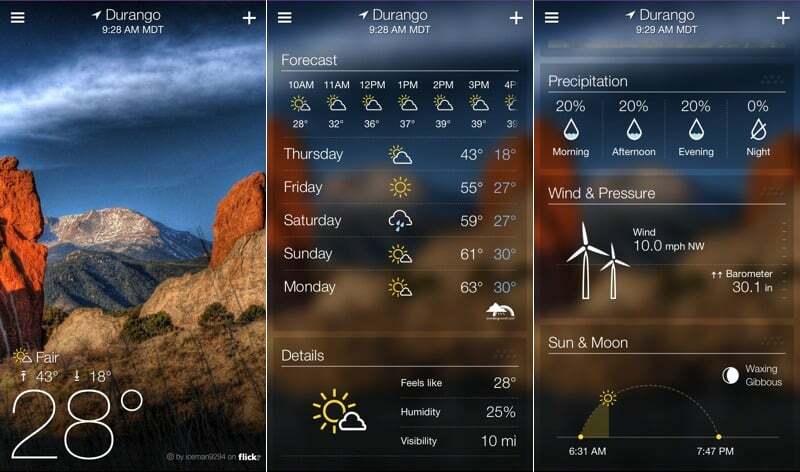 Start your day off with a good Weather App on iPhone or iPad. A good weather app for iPhone is a must have since it allows to check what’s coming ahead and be prepared to save yourself from getting drenched. There are hundreds of iOS weather app available on Apple AppStore, also the built-in weather app on iOS is an elegant one with nice looking graphics and animation. Many people may do not like the default app, and everyone has their taste of seeing data for various aspect. 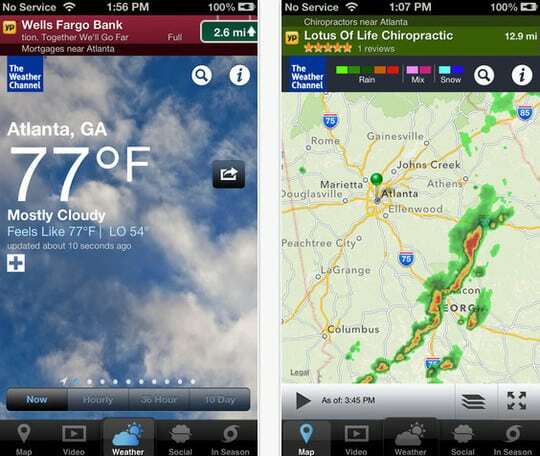 Hence, we are to make a list of best free weather apps for iPhone & iPad. 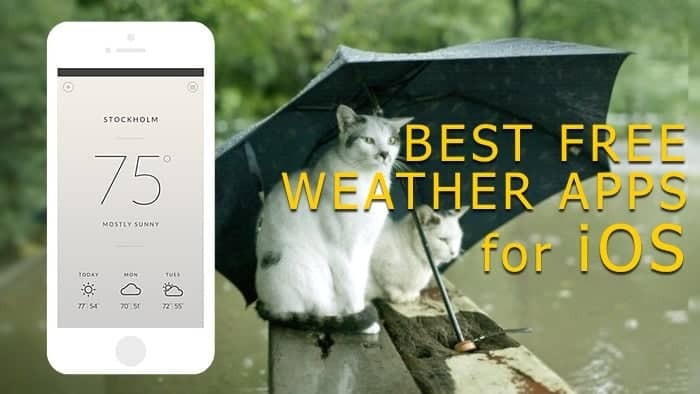 If you have an iOS device and not found the ideal application for weather info, here we come to help you with our excellent selection of Best free weather apps for iPhone and iPad. 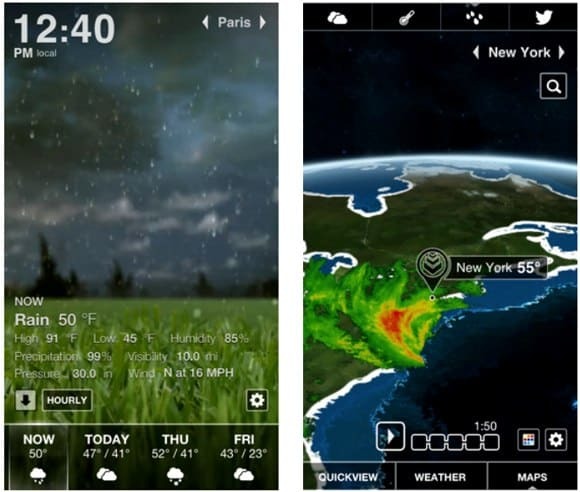 If you want a free weather application for your iPhone or iPad; check out these best free iOS weather apps below, compare them and find the one you like most. An excellent weather App developed by Yahoo! And the design is rather well done. The app works well-delivering information and weather forecast for many cities, including interactive maps (radar, satellite, temperature, the wind) and times of sunrise and sunset. Yahoo weather app is clean and minimalist with its modern and uncluttered interface. The simple interface displays a photo for your location, time and weather conditions. WeatherBug features local weather forecasts, a radar map, and alerts from the largest real-time weather network – plus Spark™ by WeatherBug. The app is the only tool for iOS that delivers minute-by-minute, mile-by-mile lightning strike information. The new WeatherBug for iPhone app gives you vital weather insight with a quick swipe and a glance so you can plan your day and Know Before, especially when the weather turns for the worse. With this free weather application, you will able to know the current weather condition over the World with maps and 3D animations. You can choose one or more cities to access forecasts for the week or even hour by hour and all in the beautiful scenery. Weather HD Free integrates social networking to allow you to check the weather where your friends are and also share your terms. Clear Day weather app for iOS, formerly known as Weather HD now comes with stunning videos depicting weather conditions, animated NOAA radar over beautiful 3D globe. If you are a frequent traveler, then you would love the unique feature that shows weather condition of multiple cities side by side. The Weather Channel comes with local forecasts, radar maps, storm tracking, and rain alerts. The Weather Channel is one of the most reliable weather applications used on iOS devices, offering the advantage of providing forecasts hour by hour and a ten-day forecast. The weather condition of beaches and major tourist destinations are available. 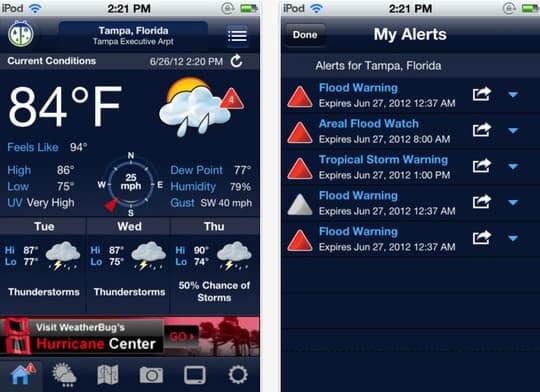 Along with Weather Alerts, the app also provides severe alerts, breaking news, and the rain/snow forecast. The social weather report feature allows people to add actual weather condition they are experiencing so others can plan the day according to weather conditions. The forecasts are based on the American GFS model and provide information in 3 hours 7 days ahead. The app indicated the strength and direction of the wind by pictograms, temperature, and the sunshine as well as the pressure at sea level and rainfall for 3 hours. 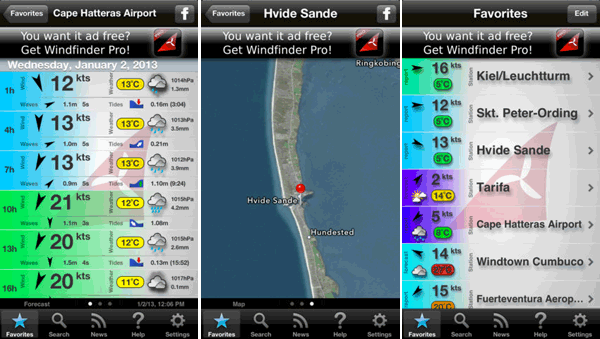 There is a premium version of Windfinder Pro app that costs $1.99 and will free you from seeing ads. 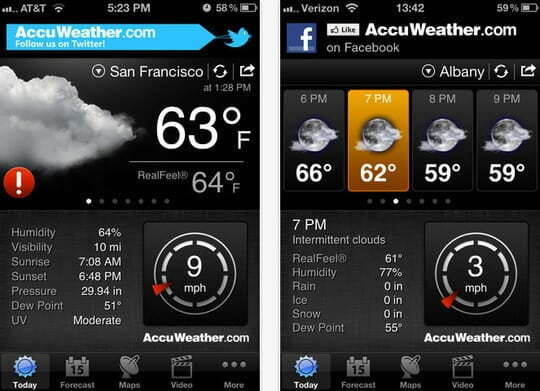 AccuWeather is a complete free weather application. You will find almost all the details i.e. humidity, wind direction, speed, UV, temperature, city, time. The apps also show the prediction of several days, the sun’s movements on the day or graphic precipitation on the same page. A radar on a map also shows where exactly the storm is forming. The finely worked AccuWeather app is famous for its accuracy, and beautiful graphics. Pilots widely use AeroWeather Lite for their flight preparations. With this app, you will get current and precise weather conditions and also the weather forecasts. 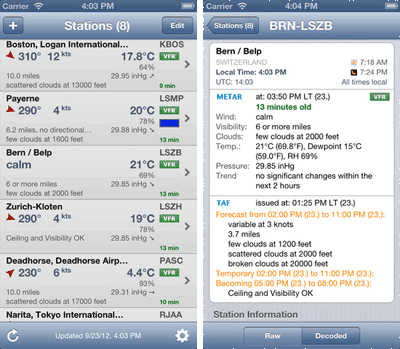 This free weather application offers you reports from worldwide airport weather stations from the built-in database by either name, ICAO code, or based on your current location. The pro version of Aero weather for $3.99 offers more features like today widget or Apple Watch app. Download these best free weather apps for iPhone, iPad and share your thoughts with us in the comment section.